Wow! This is amazing! Thanks for your time! Hiya @_Scribbles_ ! I'm sure you'll have a wonderful time here! So you love to draw, huh? Can't wait to see some of our works! Wow! This is fabulous! Thank you! Hallu @curbcat ! Welcome to MLPF! I'm sure you'll enjoy your stay here! Hello @Humble Hymn Could you get one done for me please? Here's the pony for it. Also, can I get it to be 1x1? If not then I'll take what I can get. As for the pose, could i get the pony to be flying back and forth? Thanks in advance! Hello everypony! I'm kinda in need of a new signature, and if anypony would be willing to lend a helping hoof, then... Could you make a signature incorporating Trixie? With my username on it. That's all. I don't care much for the designs. just get creative! Also, you could also place your name on the sig as credit. All fine by me! You can PM me the finished signature! Thanks a gazillion in advance!! Free Sketches of your OCs! Hello, @Laina Charm If this is still open, then could you do one for me? I'de be very glad if you could! I really like your drawing style btw.. Here's a near to precise description of my OC. The colours, Mane style, and colour code. Race: Pegasus Coat: Light Pink (f7eefd) Mane: Mostly Lavender (c2a6d7) With strips of Pink (e6baf9), Blue-Grey (c5cad4) and Mustard (e9e790) Eyes: Violet (41165c) Mane Style: Medium-length bangs over one eye, As for the rest of her mane, let it be. Tail Style: Make the design similar to the mane-style. Cutie Mark: Silver thunderbolt surrounded with golden stars. For your reference, here's a link to my oc's colour palette. also, my oc looks roughly like this one, except- she's a pegasus. Thanks in advance! Hello, @Sulfur If this is still open, then could you do one for me? I'de be very glad if you could! Here's a near to precise description of my OC. The colours, Mane style, and colour code. Race: Pegasus Coat: Light Pink (f7eefd) Mane: Mostly Lavender (c2a6d7) With strips of Pink (e6baf9), Blue-Grey (c5cad4) and Mustard (e9e790) Eyes: Violet (41165c) Mane Style: Medium-length bangs over one eye, As for the rest of her mane, let it be.  Tail Style: Make the design similar to the mane-style. Cutie Mark: Silver thunderbolt surrounded with golden stars. For your reference, here's a link to my oc's colour palette. also, my oc looks roughly like this one, except- she's a pegasus. Thanks in advance! Hi @LovingFlutter Welcome to the forums! I'm sure you'll make a ton of new friends here. What gen has the best pony designs? Yes.. I agree.. I am a late fan of the show.. The path people took to get into MLP influences their opinions.. sooo true.. Ohh.. I'm sorry for the incorrect information I gave.. I will atleast try to check my precision before posting. G1 (n Friends) Who's your favorite G1 pony? Hmm.. I think Baby Berrytown is my favourite. I really like her design! Well, although the show had gone very far.. I think the fandom is not dying.. From what I see, it's actually going further!